Incremental FTP backup means creating new copies of FTP-located data when these data have changes between the previous copy. 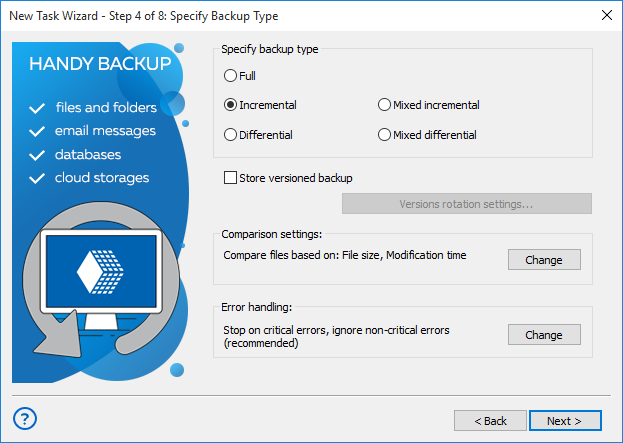 Along with full backup, differential (when only data changed in comparison with a full backup copy was saved for backup) and mirror backup, the incremental backup can be used with Handy Backup. Incremental FTP backup is actual when your FTP content (e.g. dynamic website content or the collection of FTP-stored docs) constantly but somewhat slightly changes on time. Implementation of incremental FTP backup instead of full backup allows to save most fresh versions of all changed files, taking as little time and storage space as possible. Handy Backup allows to perform incremental FTP backup along with other backup methods. Data are stored in native format, requiring no special extraction to use it and information can be stored on wide range of media. Another type of incremental FTP backup using FTP server as data storage for incremental backup of other data. Handy Backup can store incremental backups to FTP as well as to other media including local hard disks or SSDs, USB external drives, NASes (network-attaching storages), private and commercial clouds, protected SFTP or FTPS, or dedicated backup cloud service. Create a new backup task by pressing the button on the main control panel or by selecting “New task…” from main menu. Select a backup task type. On a Step 2, select “FTP” from the list of data sources. 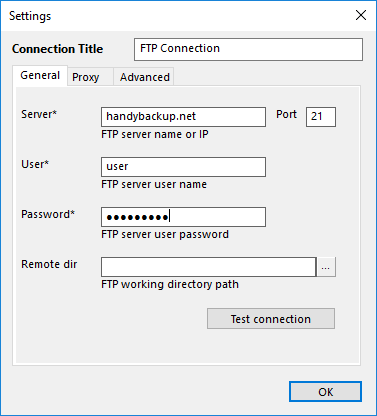 If you are have no ready FTP configurations, make one. Select data you want to backed up from your FTP source. 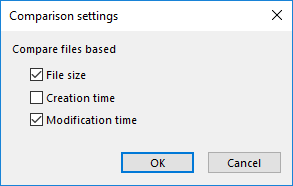 Press “OK” to close FTP data selection. On the Step 3, choose the destination for your incremental FTP backup. On the Step 4, select the “Incremental” backup method. Incremental backup can find differences between data versions based on such attributes as file size, creation time and modification time. To set up the parameters of data comparison, press the button “Change” next to the label “Compare files based on”. Select comparison criteria in the window appearing. 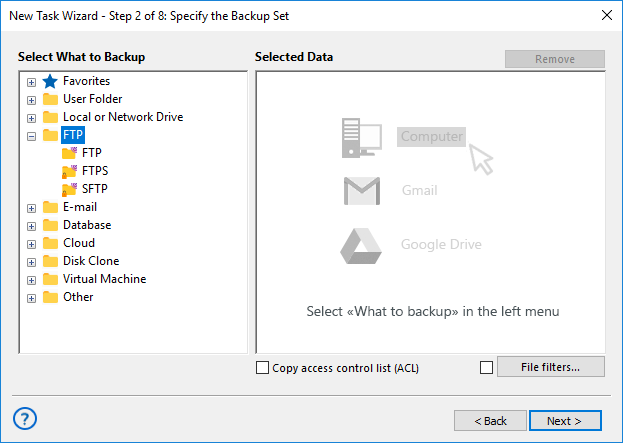 Set up other backup task parameters, such as scheduling the task, data compression and encryption, or running other utilities before or after the task. These steps are not specific for incremental FTP backup. 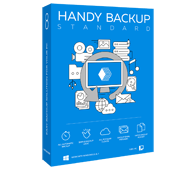 To back up to FTP you need any edition starting with Handy Backup Standard. If you want to have support for SFTP or FTPS backup, then you need Professional or higher. Free 30-days trial version! 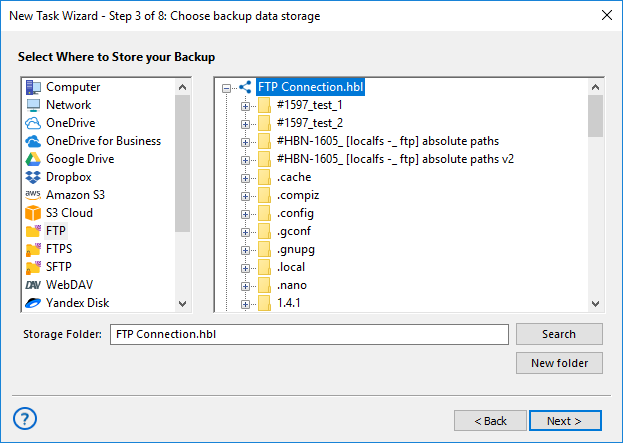 To create incremental backup task using FTP as storage, follow the sequence described above, except selecting data for incremental backup (these data can be anything include another FTP server), and then on the Step 3 choose FTP as data storage. Other operations are performing exactly the same way as described before.